I'm a huge fan of MasterChef. I have never missed an episode since I started watching it, and I really admire the contestants who push themselves hard to win the trophy and the much-covered MasterChef title. This show has inspired me to level up on my cooking and be more experimental in the kitchen. 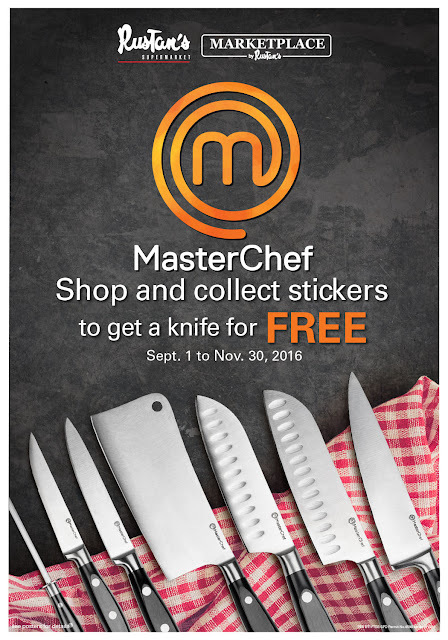 MasterChef has developed a range of kitchen knives to help anyone master our kitchen skills, and it is now available this September. The MasterChef range has eight (8) high-quality, expertly-designed knives that comes with a five year warranty. The stainless steel knives have passed food grade requirements of Germany, France, USA and Italy. The range includes all the basic knives that every kitchen should have: a cleaver for heavy duty tasks; steak knives for easy meat cutting; a small and large Santoku knife for slicing, dicing and mincing; an all-around cook's knife; multi-functioning utility knife; and a sharpening steel. Rustan's Supermarket is making owning these amazing knife set easier. From September 1 to November 30, every Php 300 spent in a single transaction will earn you one sticker plus a minimum Php 100 spend on sponsor products gets you a bonus sticker, so as long as it doesn't exceed three or the number of original stickers. You can also get the official MasterChef Apron for only Php 229 when you redeem a free MasterChef knife. Be one of the 2500 proud owners of the official MasterChef apron only available at Rustan's Supermarket.